Amazon public cloud instances can get temporary boosts in compute, network, and storage performance. This can mean that low-cost instances when running in performance burst mode can outperform more expensive instances, for fixed durations. This "burstable" performance model is built on the idea that the majority of workloads do not use system resources at peak usage all the time, but instead, reach peak usage in bursts. Credits are earned during the time when system resources are not stressed, and accumulated credits are then spent when needed to achieve top performance. When credits are exhausted, performance is throttled to a base level, typically, much lower than the burst. AWS Cloudwatch has metrics to keep track of credit balance and usage pattern. In this post I will explain the instance and resource types that can burst, and share some performance test results. Low cost T2 family of instances can use a full cpu core during performance burst mode to achieve almost double the compute power as compared to other fixed performance instance types (m4, r4..) that are based on hyper-threaded cpu. New instance families (I3, R4) offer network throughput bursts up to 10 Gbps on smaller instance types. For example, R4.large can burst up to 10 Gbps as compared to M4.large that has a hard limit of 700 Mbps network throughput. EFS file system (Amazon managed NFS service) also uses credit system where small 100 GB storage on EFS file system allows instances to attain IO burst of 100 MB/s for up to 72 minutes each day. Baseline throughput is 5 MB/s when credits are exhausted. 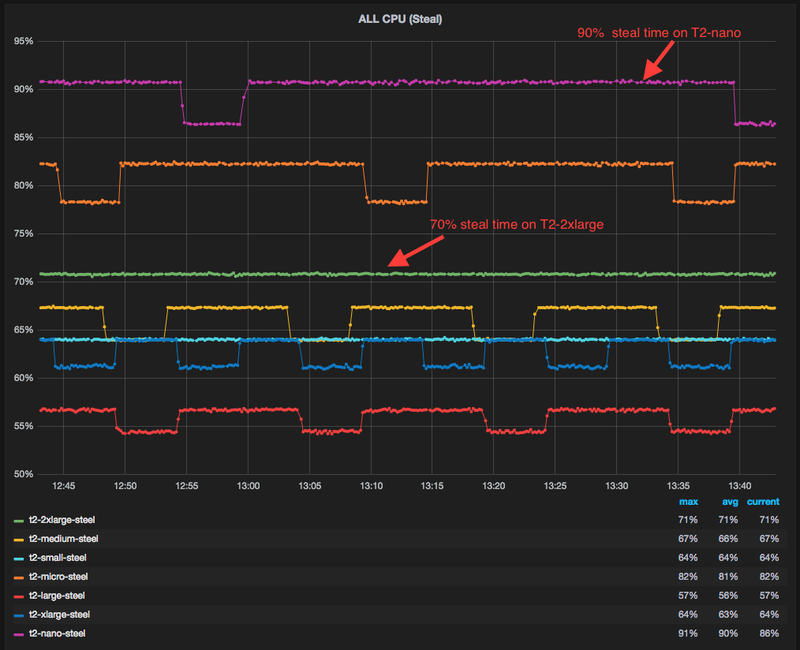 For example, T2.micro instance runs at a baseline performance of 10% of cpu core capacity. 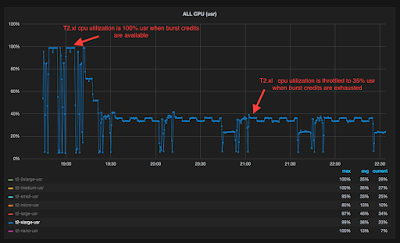 When T2.micro instance has low cpu usage, it earns cpu credits at a rate of 3 credits per hour that are accumulated into a credit bucket. Credit bucket can have a maximum of 24 hours worth of credits. Credits are used when instance requires more cpu core capacity (up to 100% of cpu core capacity can be used during burst). All newly launched T2 instances receive an initial supply of 30 cpu credits, enough to sustain a single cpu full core usage for 30 minutes. Caution: Credits earned 24 hours ago get expired and removed from bucket if not used. During performance burst mode older credits earned in last 24 hours clock are applied first towards burst credits. *** Credit earned 24 hours ago will expire and leaked from the credit bucket if not used. Linux kernel offers metrics: %steal, "st", as reported by mpstat and vmstat, that can be used as an early indicator for CPU credit exhaustion. %steal is the percent of time when instance vCPU is not running on a physical CPU. If the metric reports 70% CPU steal time, that means only 30% of physical CPU core can be used by the instance. %steal is often thought of reporting noisy neighbor in a multi-tenant public cloud environment, where other tenants may have stolen an instance's CPU resources. In case of T2 instance family, it is showing when an instance was unable to burst. In this case, %steal is a bit misleading. 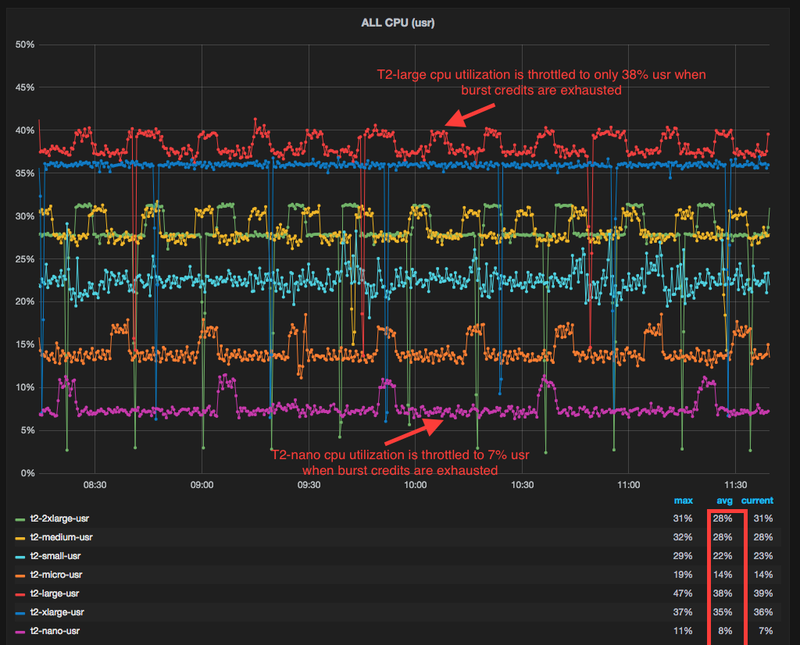 Perhaps it should be called "%unable-to-use-the-physical-cpu" due to failure to burst"
%steal cpu utilization across T2 instance family while running CPU load with cpu burst credits exhausted. %usr cpu utilization across T2 family while running CPU load with cpu burst credits exhausted. Workload cpu utilization is throttled to fraction of cpu core processing capacity. For example, T2.2xl can accumulate maximum cpu credits of 1944. 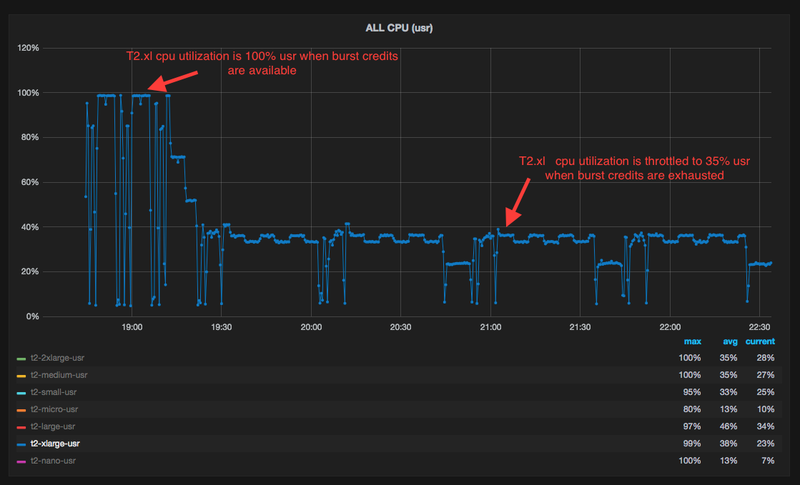 Each cpu credit can provide one minute of full cpu core usage. T2.2xl has 8 cpu cores. Multithreaded workload using all cpu cores can sustain peak throughput or performance burst for duration of 4 hours ( 1944 / 60 / 8 = 4.05 hours). 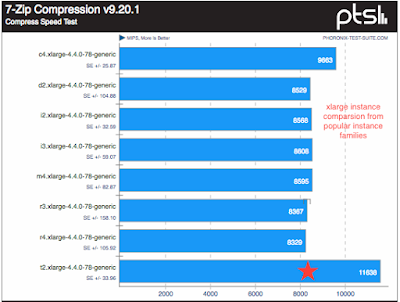 Burst can last longer if only subset of cpus are fully utilized and others are sitting idle. Caution: There is only 30 minutes of performance burst mode is available on freshly launched T2 instances and that includes credits consumed for booting the instance. AWS offers instance types with varying network capabilities. Network throughput of instances is advertised as: Low, Moderate, High, up to 10 Gbps, 10 Gbps and 20 Gbps. New instance types supports Enhanced Networking feature that allows even a smaller instance to achieve higher network throughput and low latencies. Enhanced Networking feature allows native driver to run on an instance where it can have direct access (DMA) to subset of NIC hardware resources via PCIe SR-IOV extension that helps achieve low latency networking due to low virtualization overhead. In addition to Enhanced Networking, instance families like I3 and R4 offer Network burst feature on smaller instance types (l|xl|2xl|4xl). These instances use network credit model, similar to CPU credit model used for T1 instance family and and IO credit model for EBS GP2, ST1/SC1 and EFS storage. Instance accumulates network credits during low or no network traffic. Larger instance gets more credits and thus can sustain network burst of 6 Gbps for a longer period. Once all network credits are consumed, network throughout is dropped down to base levels. Credit system for network throughput works best for bursty workloads like Hadoop, large file transfers, that may require higher network throughput for a shorter period of network activity. Caution: Check if instance is configured correctly for Enhanced Networking. Run: $ sudo ethtool -i eth0. If driver field shows: ena or ixgbevf , then enhanced networking is properly configured. Network throughput when peers are located in the same AZ (No placement group). Considering instance Network Interface Card (NIC) on new instances supports multiple queues (RSS), load was generated from multiple 8xl instances in parallel to achieve maximum possible throughput. Amazon offers Burstable IO performances on EBS volumes of types: GP2, ST1/SC1. EFS (AWS NFS managed service) also offers performance burst feature. EBS GP2 volumes are optimized for higher IOPS and lower latency. EBS GP2 volumes use IO Credit model. IO credit model is based on number of IOPS. Credits are accumulated during low or no IO activity. IO credit allows the instance to achieve higher IOPS (Burst) on volume. Duration of the burst is dependent on the fill rate of IO credit bucket, that is controlled by the size of the volume. Larger the volume faster the IO credits earned. Maximum IO credit per volume is 5.4 Millions IOPS. Earned IO credits can be spent at the maximum rate of 3000 IOPS. IOPS can be of size 16-256 KB. Once burst IO credits are exhausted due to sustain IO load, IOP or throughput are dropped down to baseline levels. 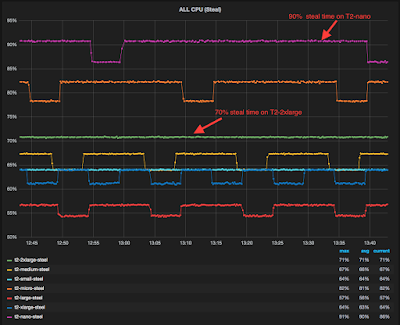 Baseline IOPS is also dependent on the volume size. IO Credit model is applicable to GP2 volumes <= 1TB only. 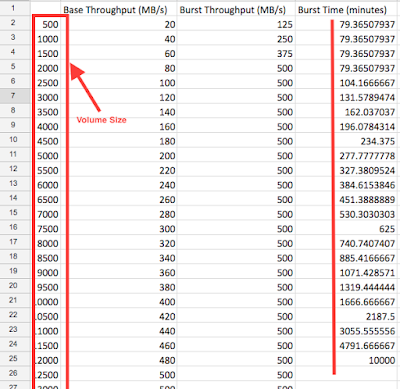 Volume larger than 1 TB does not require burst considering the baseline is already 3000 IOP. Maximum baseline of 10,000 IOPS is possible with 3.3 TB GP2 volume. It is recommended to use EBS optimized instances that use dedicated network link to storage instead of production network. There is a IOPS and throughput limits on a per GP2 volume and per instance level and that means if your workload require more IOPS and throughput that is offered by a single GP2 volumes, then consider stripping (raid 0) across multiple volumes to achieve higher IOPS and throughput until instance level limit is reached. For example, m4.4xlarge instance can support maximum of 16000 IOPS and 250 MB/s of throughput. Each GP2 volume can provide 3000-10000 IOPS and maximum throughput of 160 MB/s. To achieve 250 MB/s or 16000 IOPS, one can provision two EBS volumes and configure them as RAID-0. For 100 GB GP2 volume, it takes 90 minutes to fill the IO bucket once it is empty and offers 3000 maximum IOPS of sizes 16 - 256 KB. 1 TB GP2 volume can be filled in 40 minutes. To achieve maximum IOPS supported by volume, one should use smaller IO size. To achieve maximum throughput, one should use larger IO size. EBS ST1/SC1 volumes are designed for bursty streaming type (sequential IO pattern) of workloads. Unlike general purpose (GP2) volumes that offer higher IOPS and lower latencies, ST1/SC1 EBS volumes are backed by magnetic disk and optimized for higher throughput. For ST1/SC1, IO credit model is based on MB/s . 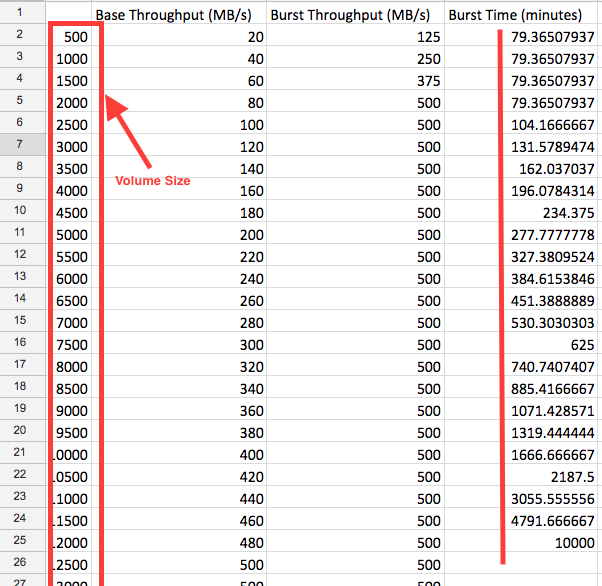 ST1/SC1 volumes offer higher throughput (500 MB/s) as compared to GP2 volumes (160 MB/s). When burst duration is exhausted, ST1/SC1 volume throughput is dropped to baseline level. IO Bucket fill time is the same for all buckets considering both bucket size and fill rate increases linearly. Fill Time = Max IO credit in Bucket / fill rate. EFS (Elastic File System) is a managed file system service from Amazon that complies with NFSv4 protocol and standards. EFS offers shared storage that can be accessed by hundreds or even thousands of EC2 instances concurrently spanning across multiple Availability Zones (AZ) within an AWS region. Unlike local filesystems, xfs, ext4, zfs, that can only be mounted on a single server, EFS is distributed file system that can span across an unconstrained number of storage servers, enabling it to grow elastically to petabyte-scale and allow massively parallel access from Amazon EC2 instances to a shared data. This distributed data storage design means applications requiring concurrent access to same data from multiple EC2 instances can able to drive substantial levels of aggregate throughput and IOPS with high levels of availability and durability. Caution: Distributed architecture and replication across AZ supported by EFS may result in relatively higher latency for attribute intensive file operation when compare to local filesystems. 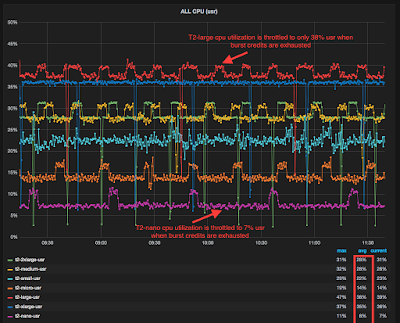 EFS sweet spot is: Read / Write operations in large block size (1- 4 MB) performed sequentially. EFS also uses a credit system to determine the burst throughput and duration. Throughput scales with the size of data stored on EFS file system. New file system with no data stored gets an initial credit balance of 2.1 TB that offers burst throughput of 100 MB/s for duration of 6.1 hours. Once initial burst credits are exhausted, credit are earned at a rate of how much data is being transferred to EFS file system. For example, EFS file system with 100 GB of stored data gets a burst credit that is sufficient to achieve 100 MB/s of IO throughput for 72 minutes each day. When no burst credits available, throughput is throttled to 5 MB/s. Baseline rate is 50 MB/s per TB of storage used or 50 KB/s per GB of storage used. In other words, 100 GB EFS file system can burst at 100 MB/s for 5% of time if it is inactive for remaining 95% in a 24 hour period. Caution: EFS uses aggregated throughput across all NFS clients accessing the same EFS file system when calculating 100 MB/s throughput. That means if 10 NFS clients are concurrently transferring files to the same EFS file system, each one will get 10 MB/s of IO throughput. Unlike EBS dedicated network link used by GP2 and ST1/SC1 storage, EFS uses production network for data transfer. Maximum throughput an instance can achieve on EFS file system depends on the instance network throughput limit.